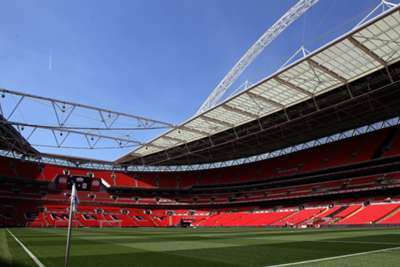 Wembley Stadium will not be sold after Fulham and Jacksonville Jaguars owner Shahid Khan withdrew his offer to buy the venue. The Football Association (FA) was in the process of considering a £600million bid for England's national stadium, with their council members set to vote on the proposal. However, it was confirmed on Wednesday that Khan had taken his offer off the table. "Earlier this year, the FA received an unsolicited official offer from Shahid Khan to buy Wembley Stadium," FA chief executive Martin Glenn said in a statement. "It was a very credible offer and was given very serious consideration. "Shahid Khan has informed us that he will be withdrawing his offer to buy the stadium - and we fully respect his decision. "Mr Khan believed that his offer to buy Wembley Stadium would release funds to help improve community football facilities in England and that it would be well received by all football stakeholders. "At a recent meeting with Mr Khan he expressed to us that, without stronger support from within the game, his offer is being seen as more divisive than it was anticipated to be and has decided to withdraw his proposal. "Wembley Stadium is an iconic venue that is revered around the world and it will continue to thrive under the ownership and direction of the FA. "There has been much deliberation on both sides of this debate and it has undoubtedly raised awareness of the issue that community football facilities in England need significant investment. "We would like to thank the football stakeholders, Government, FA Board and Council members for their collaborative approach throughout this process. We will continue to work together to identify new and innovative ways of investing in community football facilities in the future." In his own statement, Khan suggested the latest development was not necessarily the end of the matter. "I cannot rule out revisiting the opportunity at another time when perhaps the Football Association family is unified in its views on the opportunity," he said. The Jaguars have been playing annual games at Wembley since 2013 and Khan stressed that he remains committed to both their London arrangement and redeveloping the area around TIAA Bank Field in Jacksonville. "While this is a disappointing development, we will continue to emphasise London and the role the UK plays in ensuring a promising long-term future for the Jaguars in downtown Jacksonville," he added. "London as the Jaguars' home away from home remains a priority. Downtown Jacksonville with the Jaguars serving as a catalyst in its revitalisation remains a priority."